The house is roomy with places to be alone if you are in a group. There are 4 cosy cabins with their own outdoor shower, toilet and basic kitchen. Large lawn for playing with the kids. A fire pit in the front and a lovely terraced garden at the back. Ample parking. Waikino school which can be viewed from the house has a neat little playground which resounds with the laughter of children. This area and surrounds has bush walks and mountain hikes up the slopes of Mt's Karangahake and nearby Mt Te Aroha. Relax in the hot pools in Te Aroha. Surf at Waihi beach and swim the cool waters at Dickey Flats. Immerse yourself in the historic past of this goldmining area. The goldfields historic railway is just minutes from the house. This vintage train makes a one-hour 6.5km trip from Waihi to Waikino and back. There are trains Mon-Fri at 10am, 11.45am and 1.45pm, and everyday during school holidays and throughout Jan and Feb. Play on the front lawn or just chill on the deck with a good book Location is on the brow of a small hill looking north east. You will need a car to get here and travel to the many attractions in the area. The cycle track passes Waikino minutes from the house. Walk through the tunnel to reach a beautiful swimming pool on the river or just walk the many tracks in gorge and Mt Te Aroha and Mt Karangahake. 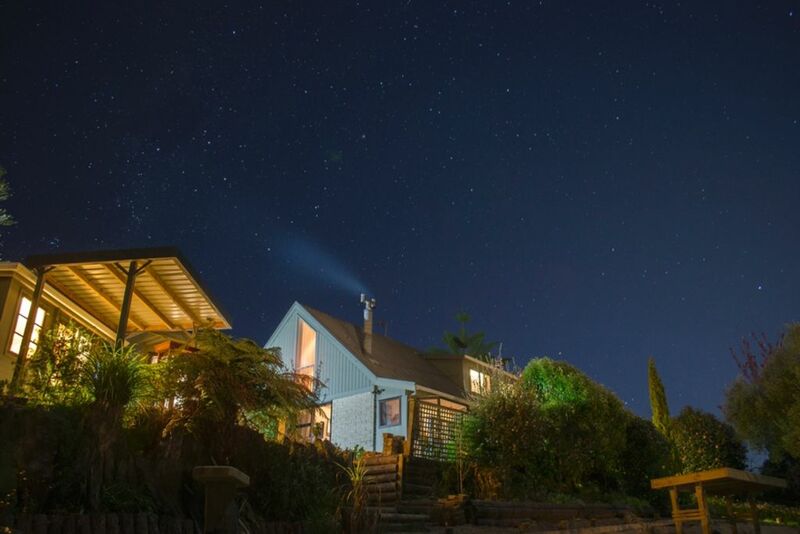 Starry nights is a family holiday cottage. The two story house can be booked for a reduced rate of $600 per night for up to 10 people. The room rate applies for small numbers. Fresh Linen is provided. Enjoy your visit and please leave the property as you found it. Please enquire for special rates for long term stays. There is a cleaning service which is charged if the whole property is booked for more than 5 days. I have a passion for my garden and love this area. Especially proud of the quirky cosy cabins that dot the grounds. Always something to create inside and out. I love meeting fellow travellers and sharing this paradise with you all. Cycle the gorge and carry on to Waihi, Paeroa, Te Aroha and Thames. Tramp the local tracks through the beautiful bush and alongside rivers. Learn about NZ's gold mining history in Waihi, Waikino and the surrounding area. Lots to do and repeat doing. Awesome location, quiet and secluded. Great property with lost of space and cute cabins. Would recommend for a big family as it is a very great location and the house is more than big enough. Only downfall was the small fridge and kitchen for such a big place. Note cyclists - STarry Nights is on top of a hill! Note cyclists - STarry Nights is on top of a hill! We thought we could cycle to Falls Bistro for dinner but this is not a great idea! If you are riding the trail, just make sure you don't count on cycling back to the bach after a night out. This property is ideal for a large number of people or has the ability for only part/parts of the property to be booked. What an amazing house and associated cabins. What an amazing house and associated cabins. Certainly the only place I could find in the upper north island for a large family gathering. With so many activities, walks, tunnels, and train rides just on the doorstep the kids had heaps to do. We will certainly be looking to come back one day. Cheers Richard.